Soak daliya with 2 cups of water for 1 hour. Heat 1 tablespoon oil in presser cooker. Add cumin seeds, green chilly, soaked daliya, salt and 1 cup of water, mix well. Cook for 2 whistle. Let it cool down. Heat 2 cups of water in pan. Once it boiled, add soya chunks, and cook for 5 minutes. Switch off the flame. Squeeze soya chunks, remove excess water from it, keep aside. Heat 2 tablespoons oil in pan, add mustard seeds, hing, onions, garlic paste, ginger paste and sauté for 1 minute or onion till brown. Add fresh green peas, carrot, soya chunks, salt, red chilly powder, turmeric powder, mix well. Cook for 2 to 3 minutes. Take serving plate. 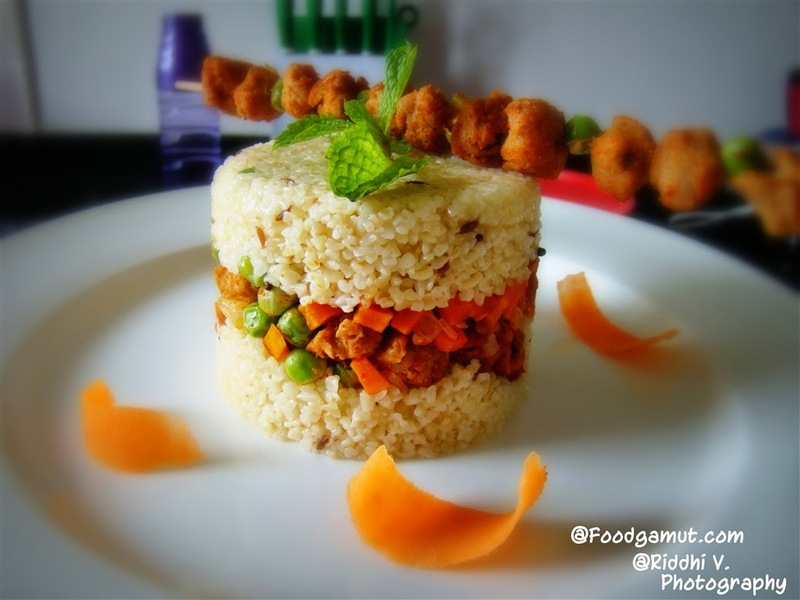 Make layers – daliya, soya chunks mixture, daliya using ring mold. Garnish with mint spring. Serve it with curd.